First and foremost a special Happy Birthday to THE BF. He is a quarter century today! Wish I was there to celebrate with him but I will be back from New Orleans tomorrow. 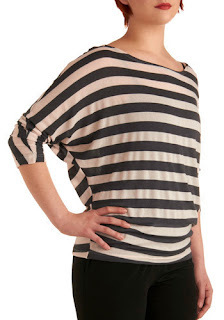 Today we're going to talk a little bit about the dolman sleeve. This is a sleeve that is much wider at the arm-hole than it is at the wrist. It can be a really interesting addition to a blouse. The neckline is so beautiful, I love the billowy shape with the sleeves. I would wear this with a bold long necklace or an electric pink skinny belt. I just love this for a weekend grocery shop. 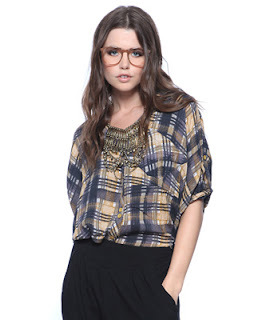 While I would style this top differently; I just love the mix of plaid with a button down and dolman sleeve. So a dolman sleeve is usually a little more casual, but it adds a flirty detail to your sleeve.